Bespoke, exquisite and extraordinary cakes and confections for any occasions, specializing in novelty and wedding cakes. First off, thank you for visiting my page! I hope you feel right at home here, and that you find what you are looking for. I was born and raised in Germany and I do believe that is where I got my love for baking from. Christmas in Germany is filled with homemade cookies and sweets made in Grandma's kitchen: the only truly warm room in the entire house, and naturally the best smelling one. At the same time, I am a stereotypical German perfectionist... It's not unusual for me to grab a ruler and spirit level to make sure my cakes are just right. When I came to Johannesburg nearly a decade ago I immediately fell in love with the beauty of this country and its people. Since arriving here I got my honours in Fine Arts (WITS), which influences my work hugely. You might find that quite a couple of my cakes or cookies are hand-painted; and I think of a biscuit or a fondant-covered cake more as a blank canvas than something to eat. 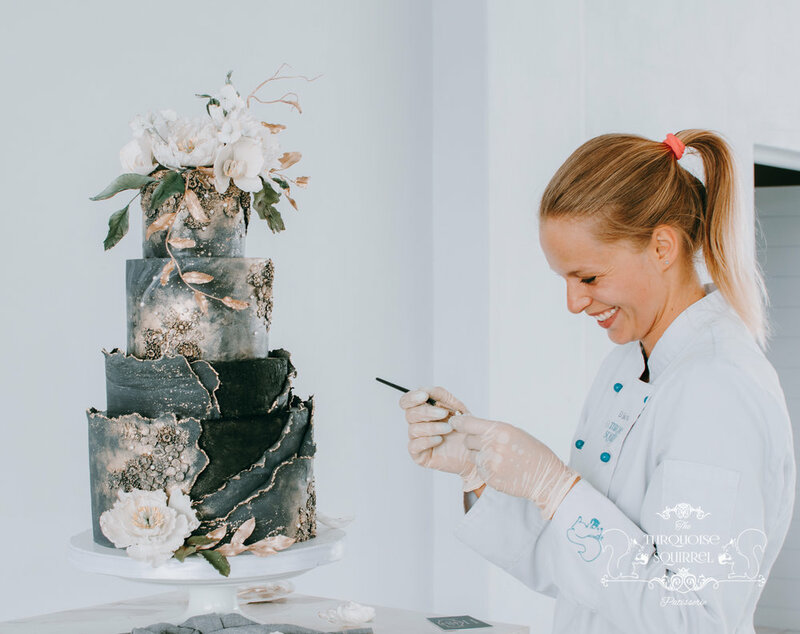 Still, it is very important to me that my confections are delicious, but also works of art that are handcrafted and put together with thought and love. I am always up for a challenge and love making entirely customized goodies. So please do drop me a line, and we can chat about your vision for your event. The Turquoise Squirrel Patisserie only operates through orders and by appointment. The goodies that I offer are biscuits, cupcakes, cake-pops, macarons, choux pastries (Croquembouche), mirror glaze cakes, a selection of homemade sweets and candies, and obviously all different kinds of cakes (wedding cakes, birthday cakes, celebration cakes, ...). Please feel free to contact me for any queries.